My friend and colleague Loc dropped a nice little New Years gift on me and the 2 boys. 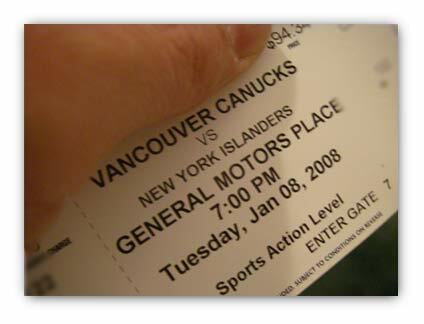 3 tickets for the Canucks.Islanders game tomorrow. wow! that’s cheap. These tix are almost 100.00 each !!! Its funny what the value of things are depending on if you are a rabid fan or casual spectator. I see tickets to the Sacremento basketball game go from $10 – $965!